On Friday, September 11 the largest organised road trip in Europe, the Cannonball Run arrives in to Sligo town at 5.30pm. 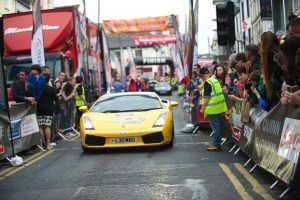 SLIGO WELCOME: A Lamborghini drives down O’Connell Street flanked by hundreds of spectators at last year’s Cannonball Run. Spectators can get up close and personal with 180 of the finest cars on the planet until 7pm and then enjoy the unique festival atmosphere that Cannonball is renowned for. The action packed Supercar spectacle is held in aid of the Make-a-Wish Foundation. It is coming back to Sligo after a huge welcome in 2014 and excitement is mounting. Sponsored by Manhattan Popcorn, Cannonball goes up a gear once again with 180 supercars and over 150,000 spectators expected to line the streets all over Ireland. Soap stars Ryan Thomas from Coronation St and Adam Thomas from Emmerdale will be joining celebrity cannonballers this year and some of the most unique cars in the world are being shipped in for the event this year. The gleaming convoy will drive through 820km of Irish open roads through Dublin, Leitrim, Sligo, The Wild Atlantic Way, Killaloe, Killarney, Cahir and finishing in Wexford. The gleaming convoy will leave Sligo at 10.30am on Saturday so spectators can enjoy the excitement and spectacle once again. As well as the cavalcade of Ferraris, Porsches, Aston Martins and more are three even more exclusive hypercars, a Pagani Zonda, a Koenigsegg and a Porsche Carrera GT. These three alone are worth €4 million. As well as the supercars, some of the novelty vehicles confirmed for Cannonball this year include an authentic DeLorean complete with Doc and Marty McFly, An NYPD Car with full kit, Smokey and the Bandit Truck, The Ghostbusters car and a most unusual Top Gun-inspired car.